This cake is really good but it takes some time to make all three components. If you want to speed things up, you can use whipped topping (you’ll need a 16 oz tub) for the sweetened whipped cream. Otherwise, whip and sweeten cream as directed. Preheat oven to 350 degrees F (175 degrees C). Grease and flour two 8 inch cake pans. Combine milk and vinegar to make sour milk; set aside. Sift together the flour, sugar, cocoa powder, baking soda, baking powder and salt. Set aside. Whisk together the eggs, oil, coffee and vanilla in a large bowl. Stir in the sour milk. Gradually beat in the flour mixture, mixing just until incorporated. Pour batter into prepared pans. Place pans on center rack and place a cookie sheet on lower rack just in case there are spill-overs. Bake for 30 minutes, or until a toothpick inserted into the center of the cake comes out clean. Cool completely before filling. With long serrated knife, split each cake layer horizontally in half. Tear one split layer into crumbs; set aside. For finer crumbs, you can pulse the cake layer in the food processor. To assemble, place one cake layer on cake plate. Spread with about 1 cup whipped cream; top with about 3/4 cup cherry topping. Top with second cake layer; repeat layers of whipped cream and cherry topping. Top with third cake layer. Frost side of cake with remaining whipped cream. Pat reserved crumbs onto frosting on side of cake. Arrange a bit more filling on top in a decorative way. Filling: Drain cherries, reserving 1/2 cup juice. Combine reserved juice, cherries, 1 cup sugar and cornstarch in a 2 quart saucepan. Cook over low heat until thickened, stirring constantly. Stir in 1 teaspoon vanilla. Cool before using. I think this is the first Black Forest cake without kirsch. Looks like an easy recipe and yummy to boot. Wow! That looks beautiful. It sounds really good especially with real whipped cream. Sacrebleu! Whipped topping?!? No, no… that just won’t do. Besides, it only takes a minute with a hand mixer to whip heavy cream. But this recipe truly is timely… sour cherry season is just about to begin here in the northern-ish areas of the country, and this really is a perfect showcase for the fruit. The Black Forest cake recipe I have been using for years comes from a book called, “A Piece of Cake”, author’s last name is Purdy. It was my father’s favorite as well, and well… now I am quite fond of it myself, as an adult. 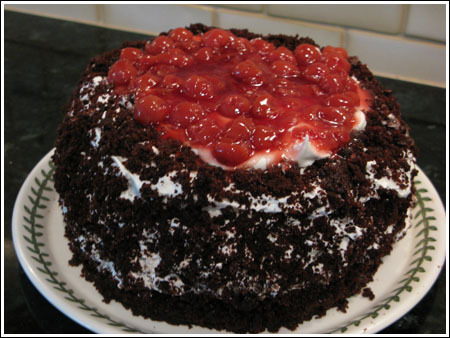 Black Forest Cake is my dad’s favorite cake. I usually try to make one for him on his birthday in July, or somewhere around then – when I get to visit him! When I was in my early teens, a restaurant I used to frequent with my mother served a Black Forest cake that I realize isn’t traditional, but I loved more than anything–rather than whipped cream, it used chocolate cream icing, almost like chocolate mousse in texture and taste which contrasted nicely with the dark chocolate-y ness of the cake, and the cherries on top were real rather than candied cherries, almost black in color. Then everything was covered in dark chocolate shavings. ‘Real black forest cake’ now tastes too sweet for me. I love the idea of the cake, but I think it’s best when it’s played with, like you’re doing. y’all are cute and sweet. enjoy the cake! go dads.